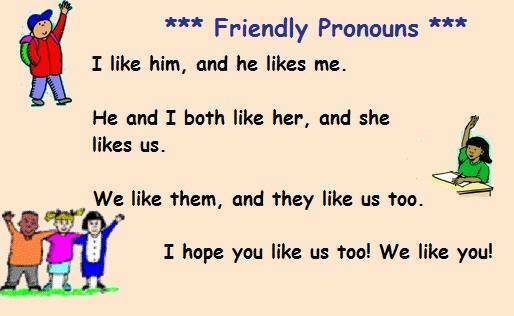 Pronouns can take the place of nouns in English sentences. Like nouns, they tell us who or what we are talking about. English pronouns may be subjects or objects within a sentence, but unlike nouns, their form changes depending on their position. Examples: I like ice cream. Mary sees me. ‘You’ is the person (or people) the speaker is talking to. Examples: You like ice cream. Mary sees you. 3rd person singular pronouns (when the speaker is talking about someone or something else) are ‘he’ (for men), ‘she’ for women, and ‘it’ for things. Examples: He likes ice cream. Mary sees him. She likes ice cream. Mary sees her. It (a dog, for example) likes ice cream. Mary sees it. When a speaker wants to indicate his whole group is involved in causing or receiving the action, he uses ‘we’ (as subject) or ‘us’ (as object). Examples: We like ice cream. Mary sees us. The 3rd person plural forms are ‘they’ (masculine, feminine, or neutral) for subjects and ‘them’ for objects. Examples: They like ice cream. Mary sees them. Possessive pronouns (and possessive adjectives, which are followed by a noun) indicate ownership or relationship. Possessive adjectives are used before nouns. Possessive pronouns are used without a noun. “Give me back my book. “Larry is her boy friend, not mine. “We just had our 25th anniversary. For information on other parts of speech, see English Parts of Speech, English Nouns, and English Verbs. Home> English Grammar Lessons> English Pronouns.